Camellias are large shrubs that are popular due to their evergreen, broad leaves and large, showy flowers that bloom from winter through spring. Without adequate yearly pruning, your camellia can become overgrown, producing less-attractive flowers and developing thin branches. Overgrown camellias are even more susceptible to winter injury from cold temperatures and strong winds. Prune your camellia to rejuvenate it in late spring or after the shrub is finished flowering. You can perform a very severe pruning on your overgrown camellia or you can employ a gentler pruning method. Older camellia shrubs can become overgrown, requiring extensive pruning. Prune away all dead, weak or damaged stems and shoots from your camellia, using pruning shears or loppers. Cut these branches and stems back to the main stem or nearest branch intersection. Cut back or trim any long shoots that have become overgrown. Thin out twiggy and crowded growth to ensure that sunlight can penetrate the inside of the camellia shrub. Remove all crossing or rubbing and scraggly branches, cutting them back to the main stem. Encourage your camellia to grow into a bushier form by pruning some of its branches back to the base of the newest growth. Cut the limbs back to the nearest bud to this point, and then several new shoots will emerge from the buds below the pruning cut. Prune away all the branches around the lowest part of the camellia's trunk as well, if your camellia is very large and old. Doing this, along with removing all the crossing, twiggy and weak growth, will rejuvenate the shrub into a more attractive tree-like form. Cut the overgrown camellia back severely, leaving only 1 to 1 1/2 feet of growth above the ground. 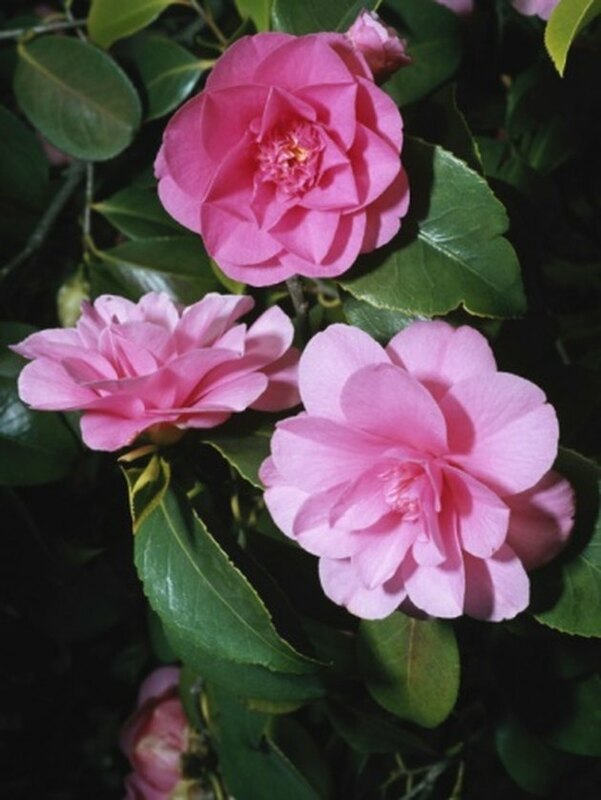 Remove most of the camellia shrub's branches and foliage. Perform this pruning in late winter or early spring. Thin all new shoots that emerge during early to midsummer by cutting any crowded shoots back to the main stems. Remove these shoots when they're about 10 to 12 inches long. In addition to preventing crowded growth, thinning out the shoots also promotes healthy branching. Continue to perform annual pruning of the rejuvenated camellia every spring, just after the flowers fade. Prune away all leggy, crowded, crossing, rubbing, dead or damaged growth from the camellia to keep it from becoming overgrown and unhealthy again. When Should Lilac Bushes be Pruned?